PARS FORTUNA: Basic is GO! 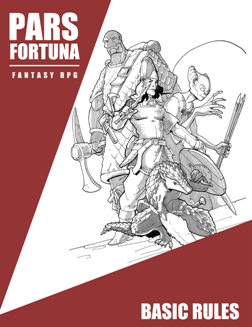 So, I’m still waiting for one piece of art before I can publish the complete rules to PARS FORTUNA – hopefully it won’t be much longer, but I’ve seen a preliminary of the art and it is worth waiting for. Anyhow – missing that art doesn’t keep me from posting the free download of the basic rules, a link to which can be found HERE, or on the free downloads page (see above and to the right). I’ve had a blast writing these rules, trying to take a randomly generated bunch of races, monsters and treasures and making them (sorta) make sense. There are some alternate rules to try out and hopefully people who play old school rules (or new school) can find something worthwhile for their game. If all goes well, the Complete Rules will soon be available on Lulu.com. The print book should go for $15, the PDF for $7. The Complete Rules will contain 12 race-classes, over 120 spells new to the old school, 120 new magic items, 140 new monsters, new magic rules, alternate rules for combat, equipment and encumbrance, rules for skills and knacks (i.e. a very simple skill system), a sample sandbox setting, a sample 1st level dungeon and general conversion notes for other old school rules – including adventurer, magician and warrior classes for folks who prefer to separate race from class. All packed into about 120 pages. For now, check out PARS FORTUNA: Basic and let me know what you think. UPDATE: I’ve incorporated some corrections suggested by JD Jarvis of Aeons & Auguries (and he wrote a review of the basic rules) and Gonster of Attack Plan R, one of the erstwhile followers and friends of the blog. All the links now point to the updated document. This looks excellent–and I don't say that just because I love pangolins. Thanks! Congratulations, It's looking good on the first pass. Looks really interesting, I'll have to check it out when I have the chance. Good stuff, John. This sort of thing is what helps keep the old game fresh and new. Well done! Just downloaded it, and looking forward to digging in! Excellent 🙂 Now if I can just read a little faster (my stack is huge) and get it posted on the blog. Thanks! I've been sent some errata from one reader and hope to incorporate it into the basic and complete rules tomorrow and get the corrected basic rules up then. A brilliant teaser for the Complete version to come. In the errata you've been collecting, did you get the pg 3 Saving Throws? It says that the number is an add instead of a target for a d20 roll. And I have one more piece of errata – thanks Gonster! Man, you just keep cranking out good stuff!